Home > About Debt > What is Bankruptcy? For a long time now bankruptcy has been considered something to be ashamed off, a last resort for when everything else has gone wrong. Despite this view still being held by many the number of people applying for bankruptcy has risen considerably. Rising interest rates, the credit crunch and the spend spend spend culture in the UK have meant debt is more of a problem than ever. There are several solutions to debt, from IVAs to debt consolidation and counselling. Bankruptcy is quite rightly considered one of the most drastic solutions can does have some quite serious consequences. If you are considering entering into bankruptcy then it is vital that you research it thoroughly. It is not something to be entered into without due care and consideration. Bankruptcy is an option open to people with a certain number of debts. 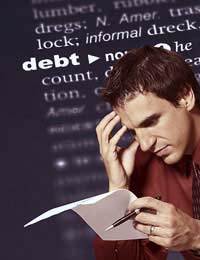 If the person in debt has considerable debts and cannot afford the monthly payments he or she may declare himself bankrupt. The debts are written off but with consequences. Alternatively the person who is owed money can declare the person in debt bankrupt (as long as the debts are a minimum of £750). Once you have been declared bankrupt there are several consequences that can be detrimental to your financial situation for several years. The person declared bankrupt loses control of all of his or her assets and can not get credit for over £250. The person declared bankrupt is also banned from taking on certain roles. For example the person declared bankrupt cannot act as Company Director. He or she may not act as a member of parliament. He or she is not allowed to work for a local authority and may not work as a lawyer or accountant. The person declared bankrupt should be able to be discharged after a year however the bankruptcy is still noted on your credit record and creditors will not look kindly on it. It may be that you will struggle to obtain any credit for several years to follow. One of the most drastic consequences of bankruptcy, when it comes to reputation at least, is that the bankruptcy must be made public. Therefore it is not possible to keep the situation from your family and friends. The fact that bankruptcy is often seen as shameful makes announcing it publicly even harder. The reputation, though still negative, is improving however, not least because many famous figures have declared themselves bankrupt in recent years. This has gone some way in reducing the stigma attached to the act. Former singer Adam Faith, Actor Bill Roach, Pop group TLC and boxer Mike Tyson are just saw of the famous faces who have been declared bankrupt at some point in their careers. Bankruptcy should never be seen as an easy option. It is a drastic action that is only taken when there are no other options. However that is not to say it should be looked on with shame or disdain. Bankruptcy, where it is suitably used, can provide a way out for people in dire straits and, with hard work, it is possible to live a normal life afterwards.